After three decades of steady but measured growth, the arrangement of having multiple generations together under one roof spiked during the Great Recession of 2007-2009 and has kept on growing in the post-recession period, albeit at a slower pace, according to a new Pew Research Center analysis of U.S. Census Bureau data. Young adults ages 25 to 34 have been a major component of the growth in the population living with multiple generations since 1980—and especially since 2010. 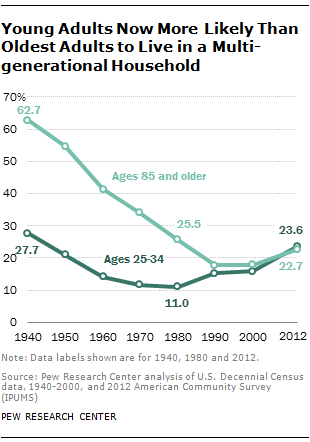 By 2012, roughly one-in-four of these young adults (23.6%) lived in multi-generational households, up from 18.7% in 2007 and 11% in 1980. Historically, the nation’s oldest Americans have been the age group most likely to live in multi-generational households. But in recent years, younger adults have surpassed older adults in this regard. In 2012, 22.7% of adults ages 85 and older lived in a multi-generational household, just shy of the 23.6% of adults ages 25 to 34 in the same situation. The increase in multi-generational living since 2010 is apparent across genders and among most racial and ethnic groups. While the share of young adults ages 25 to 34 living in multi-generational households has increased most rapidly, the share increased across all age groups with one exception: Among those ages 65 to 84, the share living in a multi-generational household decreased slightly between 2010 and 2012. 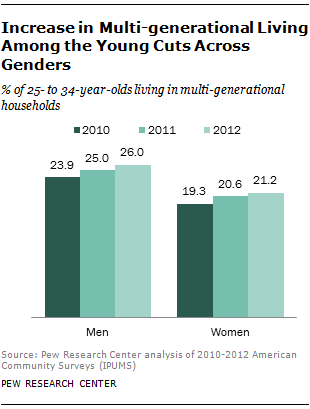 Among young adults, men are significantly more likely than women to be living in multi-generational households. In 2012, 26% of men ages 25 to 34 were living with multiple generations of family, compared with 21% of women in that age group. For most other age groups, women are more likely than men to be living in multi-generational households. Which Young Adults Are We Counting? This analysis does not include persons living in group quarters (including college students residing in dormitories) or young adults ages 18-24 living with their parents. However, these young adults could be classified as residing in a multi-generational household if the other members of their household qualify (some examples are if they are living with a parent along with a grandparent, a sibling age 25 or older or their own child). The Great Recession resulted in a large loss in employment for young adults. But the fact that a larger share of young men than women are now living in multi-generational arrangements does not necessarily imply that the job losses since 2007 have been greater among young men. Studies generally tend to show that, though men lost more jobs in the recession, men have also disproportionately gained jobs during the recovery (Carnevale, Jayasundera, and Cheah, 2012). Rather, it might simply be that young men’s living arrangements are more sensitive to employment fluctuations than young women’s are (Mather, 2011). The post-recession increase in multi-generational living among 25- to 34-year-olds is apparent among both men and women. The share of this age group living in multi-generational households increased by about 2 percentage points from 2010 to 2012 irrespective of gender. The growing tendency of young adults—male and female—to live in multi-generational households may be another manifestation of their delayed entry into adulthood. Previous Pew Research Center studies have shown that young adults are marrying at later ages and staying in school longer. Both of these factors may be contributing to the rising share of young adults living with their parents or other family members. In addition, the declining employment and wages of less-educated young adults may be undercutting their capacity to live independently of their parents. Unemployed adults are much more likely to live in multi-generational households than adults with jobs are. A 2011 Pew Research report found that in 2009, 25% of the unemployed lived in a multi-generational household, compared with 16% of those with jobs. Since job-holding is strongly associated with higher levels of education, the increase in young adults living with their parents since the recession is most apparent among those without a bachelor’s degree. Racial and ethnic minorities generally have been more likely to live in multi-generational family arrangements, and their numbers have grown with increased immigration since the 1970s. The long-term increase in multi-generational living since 1980 also reflects the country’s changing racial and ethnic composition. Racial and ethnic minorities generally have been more likely to live in multi-generational family arrangements, and their numbers have grown with increased immigration since the 1970s. In 2012 about one-in-four Hispanics and blacks lived in a multi-generational household. Asian Americans were the most likely of the major racial and ethnic groups to live in multi-generational arrangements (27%). By comparison, 14% of non-Hispanic whites lived with multiple generations of family. The racial and ethnic patterns of multi-generational living were fairly similar in 1980. That year, racial and ethnic minorities made up 20% of the population; today they account for 37%. The remainder of this report examines both the recent increase in U.S. multi-generational living and the longer-term trends over the past century. The final section looks in more detail at recent changes in multi-generational living arrangements by age, gender and race and ethnicity. Findings in this report are based on Pew Research calculations of the U.S. Census Bureau’s American Community Surveys (ACS) from 2006 to 2012, provided by the Integrated Public-Use Microdata Series (IPUMS). The trends on Americans’ living arrangements come from Pew Research calculations of Decennial Census data from 1900 to 2000 also provided by IPUMS. The IPUMS are compiled by the University of Minnesota Population Center. Documentation is available at http://usa.ipums.org/usa/doc.shtml. The definition of a multi-generational household used in this report is more expansive than the definition used by the Census Bureau. For a more detailed description of types of households and the methodology used see Appendix B. The counts of multi-generational family households for 2006, 2007, 2008 and 2009 marginally differ from previously published Pew Research Center estimates. The previous multi-generational population numbers are based on survey data tied to previous Census Bureau population estimates that have since been revised. In the wake of the 2010 Decennial Census the Census Bureau revised the 2006 to 2009 population estimates. The Pew Research Center revised the weights for the 2006 to 2009 ACS to conform to the updated Census Bureau population estimates. The resulting series of multi-generational population estimates are consistent over time but marginally differ from previous estimates. A multi-generational household is a household that includes at least two adult generations (for example, parents and adult children ages 25 or older where either generation can be the household head) or two non-sequential generations (for example, grandparents and grandchildren of any age). For a more detailed definition, see Appendix B. All references to adult children are to those ages 25 or older, so 18- to 24-year-olds living at home are not treated as an adult generation.